With less than 10 laps to go, Landon Cassill was in 28th place, two laps down to the field. Jeffrey Earnhardt was running 29th, also two laps down to the leader of Denny Hamlin. At the front of the field, Hamlin led Clint Bowyer by just under a second. Keselowski was 2.3 second back to the leader with fresher tires. “There’s a crash!,” Dale Earnhardt Jr stated loudly. Jeffrey Earnhardt got loose under Cassill. The backend stepped out on the exit of turn 3 and J Earnhardt turned the steering wheel to the right to catch it. As soon as he did that, the front end gripped quickly and jolted the car to the right. 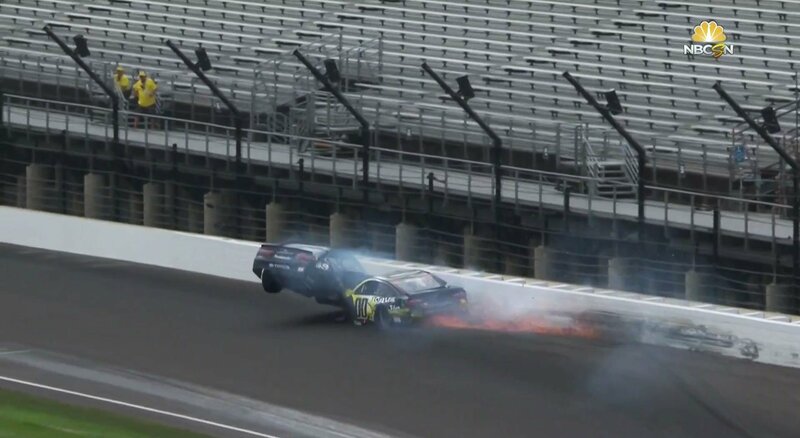 J Earnhardt slammed into the left side door of Cassill. Both cars made heavy impact with the outside wall. Earlier in the year, Earnhardt was driving the StarCom Racing that Cassill is now piloting. The caution allowed the gap of 2.3 second to be evaporated. For the restart, Brad Keselowski would start directly on the bumper of Hamlin. Clint Bowyer spun he tires at the launch. Keselowski moved to 2nd and was all over the back bumper of Hamlin. With just two laps to go, Keselowski got him aero loose off turn one and again off turn two but Hamlin fought back on the outside. They ran side by side down the back stretch. They ran side by side through turn three. They touched lightly off the exit of turn three. Keselowski drove it deep into turn four and he cleared him to take the lead away coming to the white flag. Keselowski was on cruise control from there to take the win. Hamlin went on to finish in 3rd. Hamlin has yet to pick up a win in 2018. He came close many times including the race at Indianapolis Motor Speedway on Monday. He’s one of the 16 drivers to transfer through to the NASCAR playoffs. He locked his position into the playoff rounds following Darlington. But, he doesn’t want to hear about that. The comments from Hamlin are almost a direct copy of Clint Bowyer’s comments from the weekend before at Darlington Raceway. In that case, Bowyer was complaining about the #99 of Derrike Cope. Jeffrey Earnhardt recently announced a deal that give him a full-time ride through the duration of the NASCAR playoffs. He hasn’t commented on the incident in the closing laps of the IMS event. However, a few fans were pestering him on social media after the incident. @jlogano22nascar please stop tweeting ?